Claire Van Aken is a sophomore at Jacksonville High School. She is a member of the school’s dance team, the J’ettes, IDTA State Champions 2018. Aside from her school activity, she is a committed dancer at Sara’s Studio of Dance where she holds over ten national titles with her team. She also enjoys spending time with her family, dog, and friends. After high school, Van Aken plans to pursue a career in writing and/or interior design. Taking journalism will give her the opportunity to write for the Crimson J and grow as a writer. Claire often writes in her freetime at home over numerous topics. 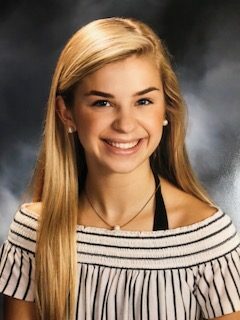 Since her dad is a former football coach and the current Athletic Director at JHS, she spends much of her time attending Crimson athletic events. Something unusual about Claire is that her hair was very dark when she was born compared to the bright blonde hair that people notice her by now. She hopes to give the Crimson J a perspective from the arts and athletics, not just from Jacksonville High School, but from everywhere around the world.